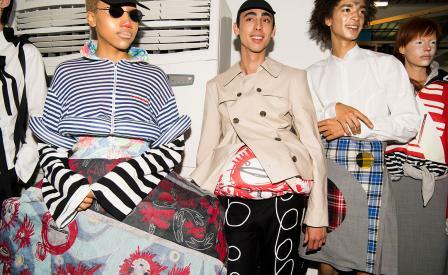 Scene setting: After only three seasons showing on the official London Fashion Week schedule, Charles Jeffrey’s performative and theatrical runway shows have become one of the most anticipated on the menswear scene. Last season, the designer sent out a pack of ghoulish figures dancing wildly to the drumbeat of The Prodigy’s Firestarter, a comment on his rage towards his hometown of Glasgow. For S/S 2019, the designer teamed up with Gary Card on a low-fi tin foil show set resembling a metallic alien planet, with giant apples hanging from the ceiling, and body-suit clad aliens attached to cloud-like tubes in the sky. Charles Jeffrey has long championed queer culture and his imaginative, hyperbolic and silhouette-distorting designs explore notions of identity and creative freedom. For S/S 2019 he was looking to an imagined universe, ‘a serene alternative reality’, all wrapped up in shining tin foil. Mood board: Charles Jeffrey has documented his new affinity for running through his Instagram profile, and his stories are suffused with scenes of jogging in east London. Jeffrey went from the club floor to the running track for S/S 2019, injecting new elements of leisure wear into his collection. The opening look featured a high vis cycling jacket with a protruding balustrated waist, followed by a commercially savvy high shine tracksuit. Elsewhere, Jeffrey’s imagination ran wild with scribble prints, distorted silhouettes and kaleidoscopic fabrics. Particularly strong were a kilt anda suit spliced with sections of tartan, and a scribble print jacket with an oversize collar evoking a childlike impression of fields of poppies. Team work: Protective elements acted as armour against today’s fast paced world, one which sculpts identity through a computer screen or a social media profile. These included a series of breastplates, crafted by leather designers Whitaker Malem, layered over striped jersey togas.